Apple today unveiled the new Mac mini with the Intel Core Duo processor, delivering performance up to four times faster than its predecessor and providing even greater expansion in the same innovative and incredibly compact design. * Starting at just $599, the Mac mini is the most affordable way to enjoy iLife ’06, the next generation of Apple’s award-winning suite of digital lifestyle applications, and features the Apple Remote and Front Row so you can play your music, enjoy your photo slideshows, watch your DVDs, iMovies, music videos and television shows from across the room. Featuring the next generation of Apple’s breakthrough Front Row media experience, the new Mac mini gives customers a simple way to enjoy their digital lifestyle content on the Mac mini including music, photos and videos from across the room using the Apple Remote. With the latest version of Front Row, customers can now effortlessly access shared iTunes playlists, iPhoto libraries and video throughout their home via Bonjour, Apple’s zero configuration wireless networking built into Mac OS X. The new Mac mini offers a completely new system architecture for performance up to four times as fast as the previous Mac mini, including a 667 MHz front-side bus and 667 MHz DDR2 SDRAM memory expandable to 2GB. With the latest high-performance connectivity options, every new Mac mini now includes built-in 10/100/1000 BASE-T Gigabit Ethernet for high-speed networking, built-in AirPort Extreme 802.11g WiFi for fast 54 Mbps wireless networking, built-in Bluetooth 2.0+EDR (Enhanced Data Rate) and a total of four USB 2.0 ports, twice as many as the previous generation. Mac mini includes a DVI interface and a VGA-out adapter to easily connect to a variety of displays, including many of today’s most popular flat panel televisions, and now features both analog and digital audio outputs to easily connect to a home stereo. The new Mac mini includes iLife ‘06, the next generation of Apple’s award-winning suite of digital lifestyle applications featuring major new versions of iPhoto, iMovie HD, iDVD, GarageBand and introducing iWeb, a new iLife application that makes it super-easy to create amazing websites with photos, blogs and Podcasts and publish them on .Mac for viewing by anyone on the Internet with just a single click. All the iLife ‘06 applications are Universal applications that run natively on the new Intel-based Mac mini for maximum performance. Every new Mac mini comes with the latest release of the world’s most advanced operating system, Mac OS X version 10.4 “Tiger” including Safari, Mail, iCal, iChat AV and Front Row, running natively. Mac OS X Tiger includes an innovative software translation technology called Rosetta that lets customers run most Mac OS X PowerPC applications seamlessly. The new Mac mini is shipping today and will be available through the Apple Store, Apple’s retail stores and Apple Authorized Resellers. Build-to-order options and accessories include up to 2GB DDR2 SDRAM, 80GB, 100GB and 120GB Serial ATA hard drives, iWork ’06 (pre-installed), AirPort Express and AirPort Extreme Base Station, Apple Wireless Keyboard, Apple Wireless Mouse, Apple USB Modem and the AppleCare Protection Plan. 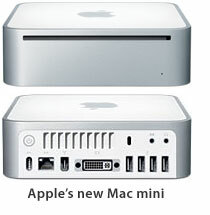 See the new Mac mini here. Communication is at a premium right now…! Is it just me, or has the entire Engadget site been down since 10 minutes after the event started? go to http://www.macrumors.com 1 minute update in new tab keep macdaily news refreshed in other tab. MAC MAC MAC MAC MAC MAC MAC MAC MAC!!!!!!!!!!! Yay! Engadget is back online! Now there is an “iPod Hi-Fi” home stereo box….